He’s come a long way since riding up and down the Hong Kong hills as a kid on his first bike, a Pinarello. In August Cheung took another step up. He joined the pro-continental Champion System Pro Cycling Team as a stagiaire and competed in his first professional race at the 2013 Tour of Utah. Cheung came to Utah after winning the 2013 Tour of Hong Kong and the Hong Kong national track championship in the team pursuit earlier this year. Combining his first pro race with competing outside of Asia for the first time, he finished Utah’s stage 1 about two minutes and 25 seconds behind the winning pace in the 179 kilometer road race; however, the last placed finisher came in over eight minutes later. Swindlehurst later explained that Cheung came off the back of stage 2 early with a couple of riders from the Funvic Brasilinvest team. After fighting for an hour to rejoin the field the stagiaire finally caught on at the bottom of the next climb. Cheung remained in Utah, traveling up to Salt Lake City. Swindlehurst stocked him with maps for three to four hour training rides. Cheung’s next appointment was with the USA Pro Challenge later in August. He dropped out of the race on the second day. The previous day on stage 1 he completed the grueling Aspen circuit race in good company, with guys like Timmy Duggan (Saxo-Tinkoff) and David Millar (Garmin-Sharp), a compatriot of sorts. Millar knows the same Hong Kong hills that Cheung trains on, having ridden there as a teen. Just coming off DNF’s at two August races, it must have taken a bit of courage for Cheung to line up in Edmonton for the Tour of Alberta. He hung in there through the prologue and subsequent two stages. Stage 3’s results show him not finishing. One of the Champion System team’s most important goals is providing the opportunity for talented Asian cyclists to experience racing at the sport’s highest level. For Cheung, that was mission accomplished. “Until now opportunities for Asian racers to compete in major international competitions have been rare,” a statement on the team’s website says. The 2013 Tour of Hong Kong, for example, is not a UCI Asia Tour race. 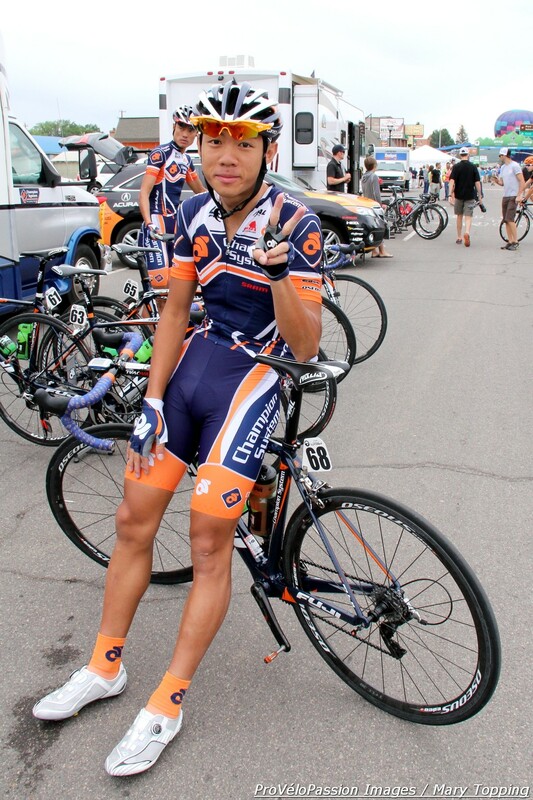 Cheung came to the U.S. and started three UCI America Tour races in the space of four weeks. If he doesn’t make the 2014 Champion System roster, it won’t be for not trying. This story is the second in the ProVéloPassion stagiaire series. See also the story about Julien Taramarcaz.